Learn How to Draw Wallace with BeanoMAX! Learn how to draw Aardman’s famous character, Wallace, in the brand-new Animate It! section of BeanoMAX magazine, which is on sale now! Behind the Scenes on an Aardman Advert! Go behind the scenes on the latest commercials to come from the Aardman studio involving Levi Roots’ Reggae Reggae Sauce. Wallace & Gromit Celebrate the Jubilee with the National Trust! 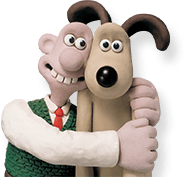 Take a sneak peek at the new short Wallace & Gromit animation that has been created for the inventive duo’s partnership with the National Trust!